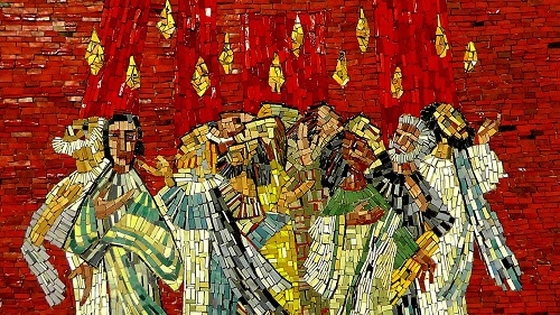 We Anglicans have always been a little fearful of Pentecost. Yes, it’s great to have it in the church calendar and many of you may still remember Whitsun – with its time of processions and a bank holiday (and for some communities, a whole week of work). But things have changed and Whitsun became the late May bank holiday – no matter when Easter and Pentecost (50 days after Easter) fell. So the Christian tradition has been lost in the general secularisation and privatisation of religion. This is a shame, because Pentecost is one of the three most important festivals of the Church (after Easter and Christmas). It reminds us that God hasn’t left us alone (perhaps that is why it is so scary) but sends his Spirit to fill our lives and lead us in living the right way. So we can embrace this or treat it with disdain! It is up to us. The invitation to “live in the Spirit” is given; we can choose to accept it or not. Perhaps the biggest challenge, if we choose to accept the invitation, is to try and follow Jesus’ words and live lives of love – caring for the others, especially the excluded, being the servant of all and not lording it over others. That might be the biggest challenge of all. But if you don’t have a faith, then following the words of Jesus leads to a kinder, more caring world. And in the midst of the current political and economic landscape – we all need some of that! So celebrate human goodness, blessed by God in the Spirit, which changes and transforms all that it touches.